With the convenience of our online file transfer module, there is no need to make a special trip to our office. You can easily send a file from your computer to ours in a matter of minutes. Enter your information in the spaces below, hit submit and we'll send you an e-mail to confirm that we received it. It's that easy. 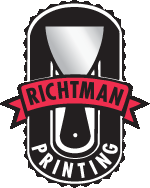 Richtman Printing supports all mainstream design software on both Mac and Windows platforms. You can submit your files in their native design software (include all links and fonts) or in print-ready PDF format (remember, PDFs have a limited ability for edits). Always compress your files into one to make file transfer quicker and more reliable. Click "Browse" below to select a file on your computer. After you've selected the file, click the "Send File" to transfer your file to us. Please use WinZip or StuffIt Deluxe to compress the file before you send it.